An old acquintance haven´t seen him in 15 years or so since I left my hometown and the local gaming club there. Love that with the community, being able to catch up with folks. The game ended in a 0-0 draw, which I´m very content with. The dwarves seemed to be unable to pick up the ball throughout the whole game, while it isn´t key strategy for all players, one still needs to pick it up in order to score. Notice the deathroller/turn marker in upper left corner. It is really nice, main bulk is an old IG Sentinel I believe. I won the coin toss and chose to receive, in order to do some proper ghoul bashing. Kick-off result “Pitch invasion” (where he had Fame +1) and touchback. I had two ogres and a snotling stunned, while I managed to roll 6´s on both his mummies and also a Wight. Pretty awesome, in my first round I managed to KO one of the mummies by fouling. I chose that flank to press down on. Picture is taken the end of my second round. In round 4 I ended one square away from end zone with a ballcarrying snot. To TD or not to TD? I chose to stall, feeling somewhat safe. That was unwise. The first half ended 1-0 for Coma and in the end he got another TD as well. Should´ve been another game if I hadn’t stalled. Oh well, it was really fun to play Coma again, he´s a really nice guy even though he constantly beats me on the pitch. Meeting a coach from Bergen, really nice guy. The game wasn´t really exciting since I failed to put his players in the dugouts and he basically out-elfed me by being more agile and faster. The game ended 3-0 to bothun, I had a shot at 1-1 at one time but it just wouldn´t happen. Games like these are humbling experiences. Fun and lively, ended 1-1 but I might have been a bit too brave with my ballcarrying ogre. Trying to dodge close to the sideline, failed miserably and the ball scattered back to my endzone 10 squares to his renegade gobbo who managed to score. I did quite early remove both the skaven and the dark elf witch was tactically wise. I´m happy with how it went. 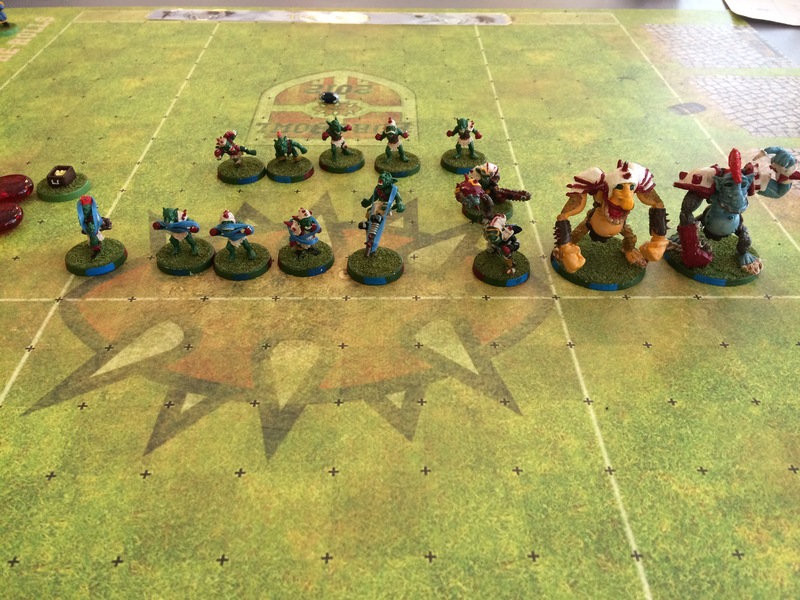 Also these marauders proved that the new AoS box is kind of perfect for making BloodBowl players. Managed to cas both the fanatic and the looney quite early, Gote had three bribes but were unable to use any of them. It ended with 2-0 in TD for me and a total 7-0 in cas. He was totally outdiced in the second half and outnumbered as well but still put up a good fight for 16 turns. Ended up 41th out of 58 players, one touchdown from best stunty and three cas from most violent player. I´m very happy with the result. The opportunity to meet up with good friends from a lot of places and seeing teams up in close which I´ve only been looking at on the web was also really good. Also played against mostly new players (for me that is). Met Coma a couple of times before (he´s a fellow StockBowl member as well) and Gote about two years ago when i fielded gobbos and he humans I believe. My roster was six ogres, six snotlings and two team re-rolls. It was what I could fit in 1100K build. I´ve got a free cheerleader from bringing a stunty team. Skillwise I had three doubles and five normal. Went for two break tackle, two stand firm and two pro on the ogres and diving tackle and leader for the snots. Quite happy with that skill selection, will definitely bring pro ogres whenever I can. It makes up for the bone head and really adds to the flexibility. I chose to try re-rolling a number of three-die-blocks when already got let´s say a push but was hoping for a POW. If I really really needed the re-roll to come through I used a reroll though (for bringing down Gotes blockfanatic for instance). Bought a 3rd edition dark elf team, need to make the second runner as well as the assassins but with these to start I have a solid foundation. They will probable be devoted to one of the more secretive of the Chaos Gods, Malal. Since his sign is a skull I do believe it could be quite fitting. More of that in another post though. It was really nice to see the teams from nickeninja, inforthepain and tjub and to have a chat with them. The damsel/coach of tjubs brettonian themed dwarf team is looking promising!